Miss Justice - Expert Motoring Lawyer defending drivers nationwide: Caution - Not All Client Testimonials Are To Be Trusted! Caution - Not All Client Testimonials Are To Be Trusted! We at Geoffrey Miller Solicitors take great pride in our bank of online client testimonials. We have collected over 100 testimonials since the firm started to request them back in 2005. All of the people providing testimony to our services as expert motoring lawyers are real clients of the firm (even when names have been withheld.) It may be surprising to see that last sentence. Of course they should be real but we know from first-hand experience that some law firms are less than truthful in their marketing materials. Back in 2008, we were made aware of a firm that used details of our clients’ cases without permission from the clients and they also sought to pass them off as their own clients rather than clients of Geoffrey Miller Solicitors! We successfully pursued the firm and we and our clients succeeded in recovering a donation to charity and damages respectively. Now in 2014 we have been made aware of another firm using the powerful tool of client testimonials in an unscrupulous manner! 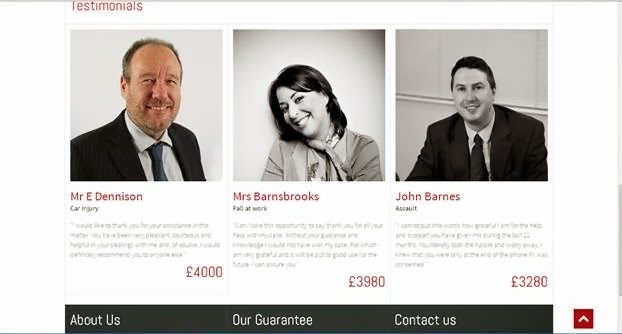 The image used on the personal injury law firm’s website came as a bit of a surprise when it was sent to me by a colleague! I had morphed into a Mrs Barnsbrooks who sued her employer for an accident at work. Not really, my image had been lifted off the internet by a law firm and they held me out as one of their clients! It was a shame really as when they received a letter from my lawyers, they tried to justify the clear case of “passing off” as an honest mistake and tried to argue that the damage was not significant as they were actually a brand new firm and had not yet commenced trading! Begs the question how they were able to have testimonials in the first place and claim to have been a leading law firm? This is why in 2010 I devised a unique interactive testimonial scheme where not only can the prospective client read about our (real) client’s experience of us from their written description published online, but they can also make direct contact with the referee to verify what they have said and ask any questions they want about us. We are not involved in the process and don’t even know when a prospective client makes use of the “Ref Me” scheme. I wanted to create a tool that was the next best thing to asking a trusted friend for a recommendation because when a client comes recommended, their suspicion and fear is massively reduced. We are in the business of selling solutions and providing relief to clients who often sorely need this. The last thing they want is to be duped by the lawyer who uses fake or stolen testimonials to capture their clients! Hopefully, our “Ref Me” scheme reassures clients that we are what we say we are, and, even more importantly, what our client Julie says we are – the best motoring solicitors in this country! Try and find an attorney you trust will do right by you. Does he or she answer your questions? If not, look elsewhere. Attorneys who discourage or avoid your questions, or fail to answer them in a straightforward way, may lack experience to handle your case.